TechPro Security Products offers customers professional surveillance camera installation and maintenance services that can meet the needs of individuals looking for either residential or commercial security products integrated to their location. Our security technology technicians can expertly perform surveillance camera installation services no matter how large a system you own. We have worked with numerous industries in order to make their locations substantially more secure. TechPro Security provides high-quality CCTV equipment that we can install in whatever layout best meets your home or business necessities. Our company offers our clients professional security system integration services. Depending on what your specific needs are our services will vary to better meet your requests. 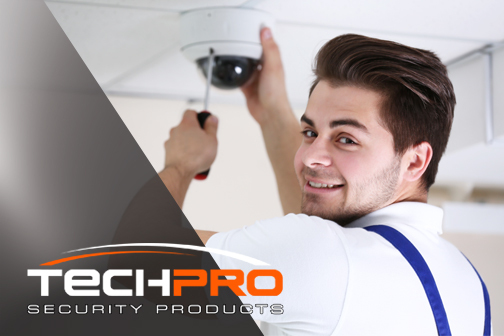 TechPro Security Products’ expert contractors can help you design a complete security system that will cover multiple facets of protection such as sound alarms, access control, motion detection, and integration with our video surveillance camera installation services. Our team can provide you with a free consultation in order to help you determine what security layout and equipment will best meet the needs of your location. We will offer our insight after a professional on-site assessment. Our no obligation consultations include security camera installation placement suggestion as well a project cost estimate. Once we have reached an agreement on a quote we can move forward toward scheduling an installation date for your equipment. Running and connecting cable and power sources to all the pieces of technology that your system will be utilizing. Surveillance camera installation mounting and placement adjustment. The configuration of your system’s cameras and any other hardware that may call for it. TechPro Security Products offers you professional CCTV system and surveillance camera installation services for all your security needs. Whether you are looking for the integration of a security system for your home or business we have the knowledge and expertise to match you with the best equipment for your location’s requirements and your personal preferences. Contact TechPro Security Products today on our toll-free telephone line 561-222-8416 or come visit us in person at our central location 99 NW 11th Street Boca Raton, Florida 33432 USA to receive your free consultation and schedule an appointment with one of the best premium security product integration companies in the industry.